Referring to my previous post which was 3 years ago regarding my Garmin Forerunner 305 (Please read) which I accidentally drowned to its death but luckily I did not throw it away including all the accessories. I still keep it in its box. 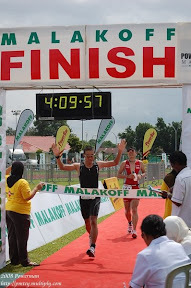 During the Keriam Half Marathon which was held on the 14th March 2010, Rafidi was asking me about my GF305. I said ‘rosak’ . So he said why don’t you bring it to Singapore and exchange it with another good working GF305 and just pay SGD$185 instead of buying a new one which costs around SGD$350. He has a GF305 and he has problem with the device and he exchange it with another GF305. So last week, I went to Singapore and went to the shop as recommended by Rafidi and without any question being asked, proof of sales, warranty card, they just exchange it with a RECON GF305. Yes it is a RECON, not a brand new GF305. I’m pretty much happy with it and now I can easily train with my GF305. This shop is one of the authorized Garmin distributor, so you don’t have to worry about the exchange program. My existing GF301 is still working but I’m having problem (but still can) recharging it and I cannot upload my records to my computer. Other than that, the GPS is still working.